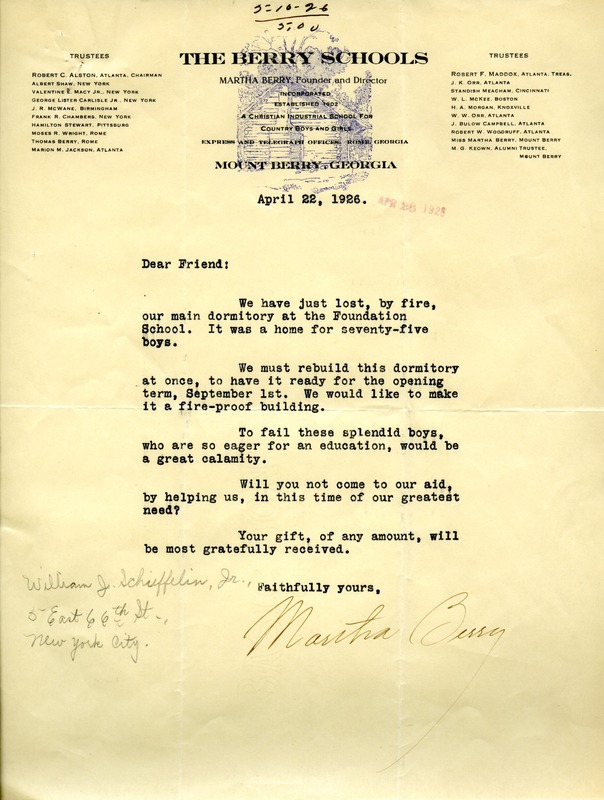 Martha Berry Digital Archive | Letter from Martha Berry to William J. Schieffelin Jr.
Letter from Martha Berry to William J. Schieffelin Jr.
A letter written by Martha Berry to William J. Schieffelin Jr., asking for funds to rebuild the main boys dormitory at the Foundation School that had just burned down. Martha Berry, “Letter from Martha Berry to William J. Schieffelin Jr..” Martha Berry Digital Archive. Eds. Schlitz, Stephanie A., Christy Snider, Paul Shamblin, et al. Mount Berry: Berry College, 2012. accessed April 21, 2019, https://mbda.berry.edu/items/show/3070.